The ROUSH GT Pulley Kit replaces the stock supercharger pulley and first sheave FEAD belt (Front End Assembly Drive) with a smaller diameter ROUSH GT pulley. This increases the speed of the supercharger, which causes an increase in the amount of airflow and equates to greater engine output. Though results will vary, typical performance gains are around 25 horsepower and 25 lb.-ft. of torque at the rear wheels over the stock configuration. 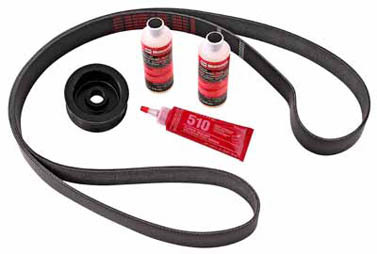 The ROUSH GT Pulley Kit comes complete with the smaller diameter pulley, a replacement first sheave FEAD belt, two quarts of S/C gear case oil, a front cover to bearing plate sealant and complete installation instructions. The kit fits all 2005-2006 model year Ford GT's. With a suggested retail of .76, the ROUSH GT Pulley Kit is a small price to pay for GT owners who want to be sure that theirs is ranked among the fastest on the planet. The part number is 401532 and more information can be found online at www.RoushPerformance.com. Based in Livonia, Mich., "The Art of Performance Engineering" takes place at ROUSH Performance. In addition to the Stage 1, Stage 2 and Stage 3 Ford Mustang and F-150 styling, handling and performance upgrades, a complete line of performance parts and engines are offered. For more information on the ROUSH Ford GT Pulley Kit, or any of the other products, visit www.RoushPerformance.com or telephone toll-free (800) 59-ROUSH.